Hello friends! To me – less is more. This is something I’ve been trying to live by in my everyday life (less stuff, less clutter, less clothing, less furniture) and something I try to incorporate into my cardmaking. I’ve been sharing some super simplistic one layer cards lately (and I have more coming! 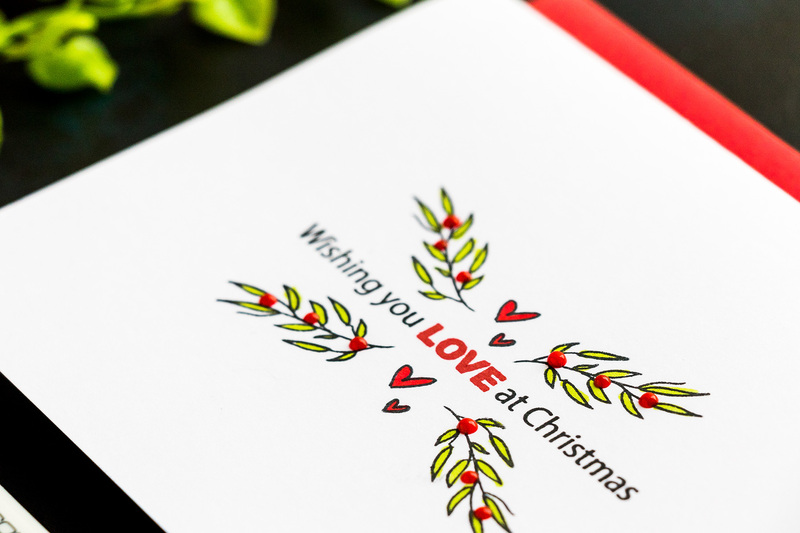 ), today I have a set of 2 Christmas projects that are nothing but minimalistic. If you aren’t into one layer cards, don’t worry! I will continue to share my other projects here as well! I’m just going through a “one-layer” phase. 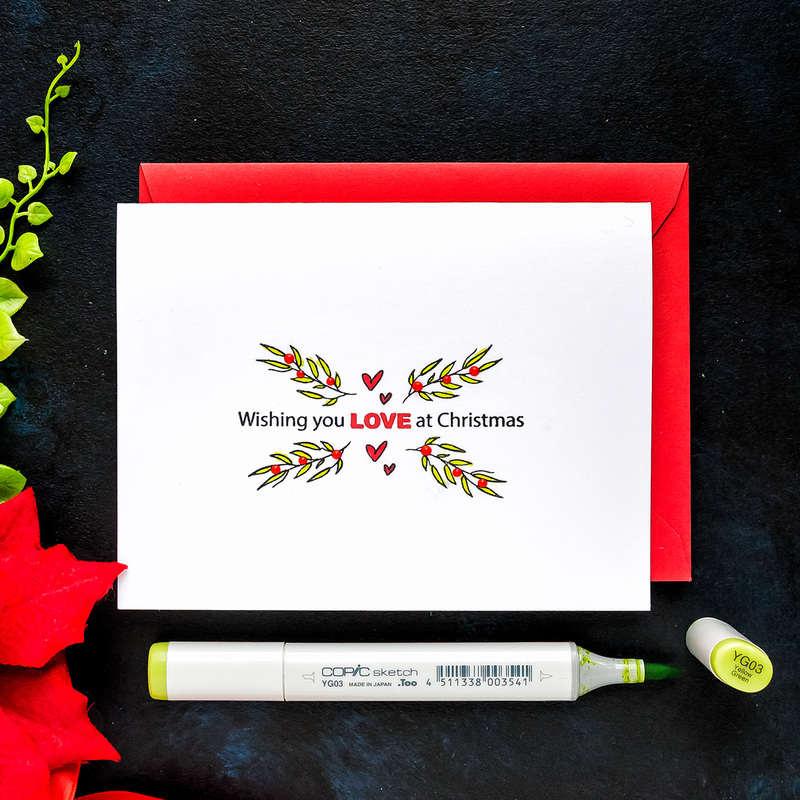 I used a “Wishing You Love at Christmas” sentiment from the Festive Trees stamp set by Simon Says Stamp and stamped it in black and red ink colors. 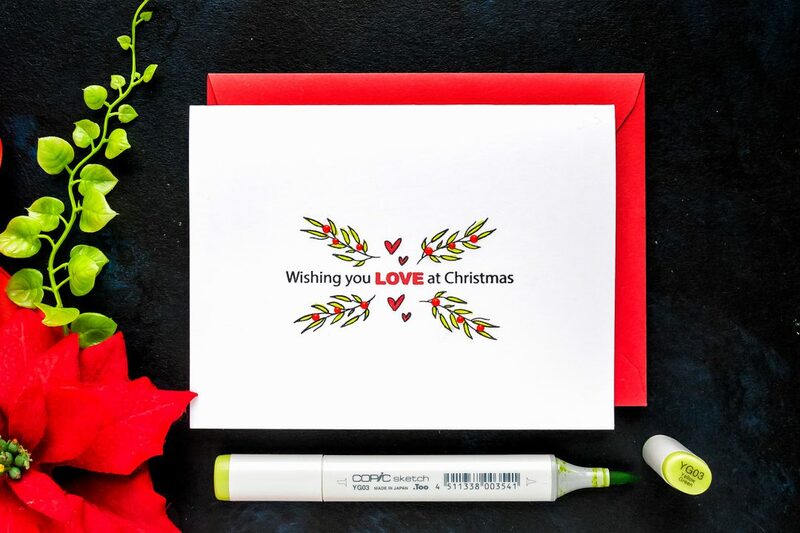 The way this sentiment is designed it easily lets you stamp the word LOVE (you can also use JOY or PEACE) in a different color, this is very clever and very handy! Next, I used branch image from the Spiritual Sentiment stamp set and stamped it 4 times radiating from the center. I also added a two heart image in between each branch duo. I used my Copic markers in YG03 and R24 to color these images and also Nuvo Drops is Red Berry to add festive berried to the branches. 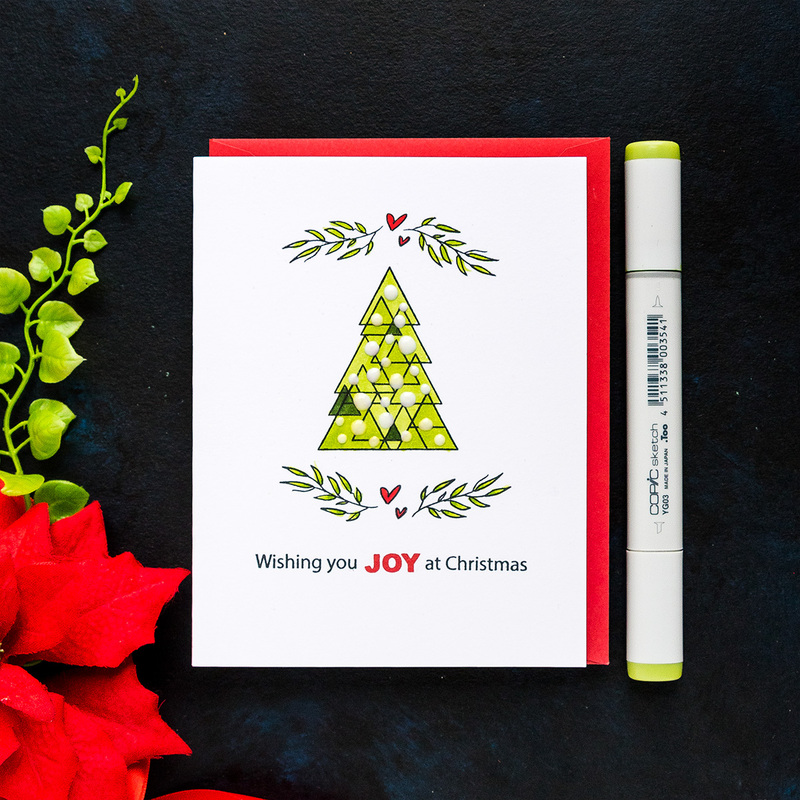 I stamped one of the Christmas trees from the Festive Trees stamp set and colored it using YG03, YG25 and YG67 markers, I also coated it with Nuvo Shimmer pen and added Gloss White Nuvo baubles on top. Like this card idea? Be sure to save it to one of your Pinterest boards for future reference! (if you are reading this in an e-mail newsletter, please click over to my blog to be able to pin this image). I absolutely love these cards! Simple yet elegant. Thanks, Yana. They may be CAS but they are beautiful! I love them. Well done! Awesome cards, Yana! Love the clean simplicity! These are awesome Yana. 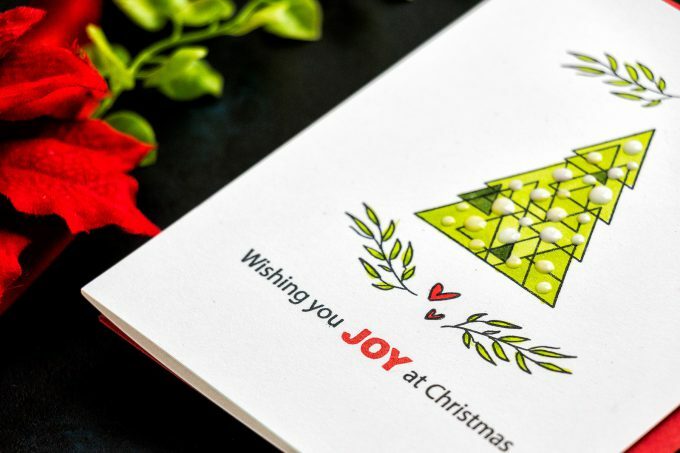 I love the simplicity of these cards and one layer cards are always a hit with me. Love these minimalist Christmas cards. The simplicity speaks loud! I think cards like these really show the skills of the cardmaker. There’s nothing to hide the flub ups, lol. Beautifully done Yana!